The popular trick-riding trio of Wyatt, 17, Zeke, 14, and Sam Thurston, 13, hung up their ropes for good after their final performance at Canadian Finals Rodeo. Since they started in 2004, the boys have performed their show almost 250 times at rodeos across the continent, showcasing their unique trick-riding and trick-roping skills. The boys trained with fearless Hall of Famer Jerri Duce Phillips, one of Canada’s most famous trick riders. The speed and precision of the Thurston Gang’s roman riding, trick riding and trick roping act twice earned them the award as Canadian Professional Rodeo Association’s Contract Act of the Year in 2005 and 2007. No word if their young sister, Tess, who clocked many, many hours in a car seat and who often introduced herself as “Tess Thurston Gang” will take up the trick riding torch. 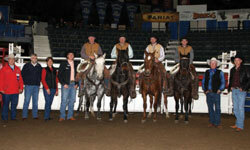 Six teams from Manitoba to Alberta competed in the first annual Invitational Ranch Rodeo at Agribition in Regina. The audience was treated to some admirable cowboy skills and, for a few cattle producers who no longer brand their cattle, a sobering shot of reality. One of the most memorable examples of skill and “try” came in the wild cow milking. Jack Regier of the 96 Ranch had roped a big, snuffy cow that went on the fight, putting considerable strain on his rope. So much so, the steel hondo of Jack’s rope broke. What impressed the audience (and the judges) was that Jack recoiled his rope, tied a hondo knot, built another loop and roped the cow a second time. His crew then mugged her and milked her – all within the three-minute limit. 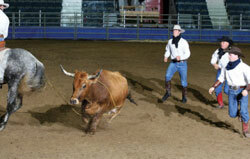 A favourite event for the spectators was the trailering – sometimes called Cattle Rustling. How it works is all four team members compete, entering into a herd and separating out two designated numbered cattle. The team must load the cattle into the front compartment of the stock trailer (no corral or loading chute) then load two of their horses into the back. Time stops when the trailer door is closed – just like on the open range. Now, just pause for a moment and imagine how long it would take your neighbour to accomplish this task… Three teams did it in under 72 seconds and the rest weren’t far behind. And that’s why savvy producers still brand their cattle. Congratulations to Saskatchewan’s Danny Udal, Arron Gordon, Dean Mackie and Cody Thomson riding for Udal Ranches of Maple Creek, Sask., who earned first place, Jack Regier, Jordie Regier, Peter Gonnet and Dale Clearwater riding for 96 Ranch of Leader, Sask. in second and Scott Lees, Jared Sherman, Jesse Russell and Lyle Miller riding for Soderglen Ranches of Airdrie, Alta in third. A major “atta-boy” to Jason Pollock, (whose day job is Agribition CEO) for winning the CCA Steer Wrestling championship (again!) and for bringing ranch rodeo to Agribition, the sixth largest agricultural showcase in the world. 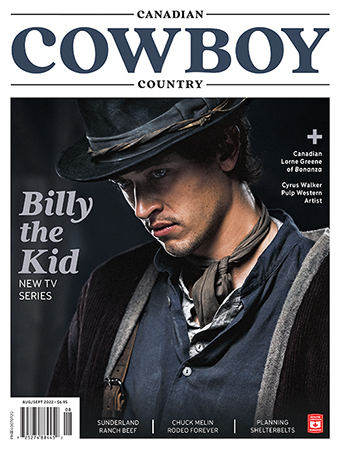 Thanks to hit shows like Cowboy Country TV, Corner Gas, Little Mosque on the Prairie and Heartland, broadcasters are realizing what we’ve known all along; the West is where the action is. The heady combination of ranching, crude oil, good land, bad love, cunning and stunning sisters, delicious deceit and gorgeous vistas has coalesced into a new night-time drama: Wild Roses. CBC began airing the hour-long, 13-part drama in January. It’s set in Alberta and sounds similar to the old classic, Dallas – albeit without the shoulder pads. This provocative series sees the battle for a coveted piece of land in Alberta between the wealthy McGregors and the debt-ridden Henrys. It’s going to be fun viewing – so tune in to see your neighbour’s riding as extras and some good Alberta and Saskatchewan-bred horses. Personally, I’m going to watch to find out what’s “simple” about a traditional cowboy lifestyle…. nternationally-acclaimed artist and storyteller Dale Auger, PhD, passed away Sep. 23. Auger, best known for his stunning art, was 50. Dale was a talented speaker, educator, writer and visual artist. His vividly coloured paintings capture the attention and imagination and are included in numerous high-profile public and well-known private collections throughout the world. 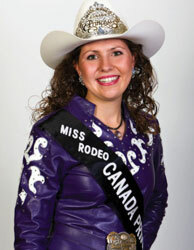 Congratulations to Miss Rodeo Canada 2009 Aaron Courchesne and Miss Rodeo Canada Princess Tara Slade! Aaron, 24, lives near Claresholm, Alta., where she works as a horse trainer and massage therapist. Aaron graduated from NAIT in 2003 with a major in Horsemanship then completed training from the Alberta College of Paramedics in 2006 as an Emergency Medical Responder. She then became a Certified Equine Massage Therapist in 2008. Tara, a recent high school graduate, has qualified for the National High School Rodeo for the past three years in various events. She lives near Nanton, Alta., and is enrolled in her first year at Lethbridge Community College in the Faculty of Nursing. Tara volunteers as a CanSkate Program assistant and is also on the Saskatchewan High School Rodeo Association Sponsorship Committee. Congratulations to Pam Keibel of Medicine Hat, Alta., whose name was drawn in our popular but tough quiz, Bucking for a Dodge. A special thanks to Dodge Canada and in particular Dodge Rodeo Manager, Martin Sobie. We couldn’t have done it without you! Legendary outfitter Dewey Browning of Caroline, Alta., passed away Nov. 21 of natural causes. 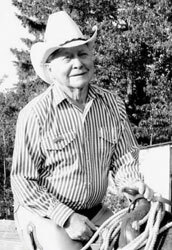 Dewey, a rancher, renowned guide and outfitter, pick up man and in his later years, a writer — was well-known for his sense of humour and strong ethics. Dewey often accompanied his son, Kurt, around the world to attend figure-skating competitions. More than 100 hours of equine education with renowned horse trainers and clinicians covering the disciplines of Dressage, Reining, Jumping and Horsemanship drew standing-room only crowds. That was especially true of the Trainers Challenge sessions that saw a new Chilliwack champion emerge. Ken McNabb of Wyoming accumulated the most points over three days of working with a two-year-old mare in the Trainers Challenge Final. They came out ahead of well-known B.C.-based trainer and three-time champion Doug Mills, whose gelding demonstrated a huge amount of progress through the training sessions. Also contending the Trainers Challenge was Charles Wilhelm of California, a former Mane Event Trainers Challenge winner from the Washington expo. The Mane Event runs in Red Deer, Alta., from Apr. 24–26 and will include a bull-riding clinic led by Gary Leffew. 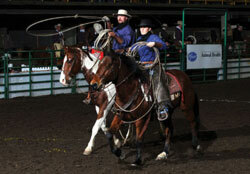 Al Dunning (Reining, Cutting and Working Cow) and Gigi Bailey (Hunter under Saddle) have also been confirmed. The Trainers Challenge will feature three-time Champion Doug Mills of B.C., Patrick Hooks of Oklahoma and Mel Hyland of Alberta. 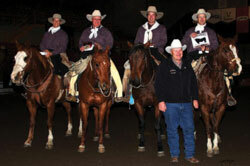 The Trainer’s Challenge is presented by Canadian Cowboy Country magazine. 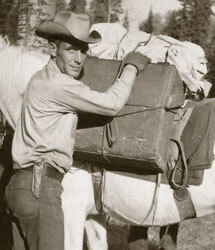 Former outrider, sponsor and chuckwagon judge Ray McCullough passed away last May 30 at 89. Ray rode as an outrider in chuckwagon racing and later was a wagon judge. He also sponsored the wagons of Garry Dorchester and Orville Strandquist. He was also known for his musical talent around the wagon barns and at the Calgary Stampede. One of the fastest-growing sports in the West has to be ranch rodeo! 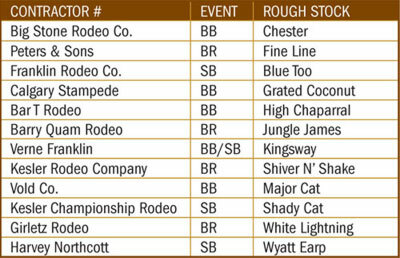 Edmonton held its 4th annual Heritage Ranch Rodeo Nov. 2?–?4 to a near-capacity audience and, to add to the excitement, at the end of it all a mere 20 points separated first and eighth place. The winning Quill Ranch (Cowley, Alta.) was well-repped by team captain (from left) Greg Delinte, Bill Akins, Jim Orr (bronc rider) and Brian Delinte. Stewart Ainsworth (standing) donated a $1,000 bull certificate fort he January bull sale at his Lazy S Ranch in Mayerthorpe, Alta. Sixteen teams of top hands started in the competition, with eight making it to the Finals. However, even skookum cowboys sometimes have a wreck. Get well wishes to that tall drink of water, Trevor Murphy, (son of working cowboy and rawhide braider, Guy Murphy) who suffered a grisly compound leg fracture when his steer in the doctoring event fell on him. Fortunately, his teammate, Arron Gordon, bailed off his horse and was able to pull off the massive steer. Unfortunately, the Udal Ranch team received a no time from the judges — even though they completed the run — for too many men on the ground. Third place was earned by the River Ranch (Riske Creek, B.C.) cowboys (from left) “The Rocket” Ed and Raquel Russell. The rest of the team included Kyle Elliot, Travis Redl and James Stafford. Raquel was a clear crowd favourite, earning appreciative applause for her sorting and roping skills. She also won the Top Lady Rancher. Cowboy Cody Thomson, who was on the eliminated Bar U Ranch team (and who had married into the Udal family a year ago), was in the crowd so he swung into Trevor’s saddle and competed in his place. An interesting but unrelated bit of wisdom; Cody’s grandfather, Ken Thomson, was the first president of the Cowboys Protective Association, the forerunner to today’s Canadian Professional Rodeo Association. Where in the World is Canadian Cowboy Country? 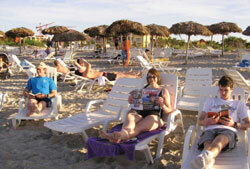 Varadero Beach, Cuba’s famous seaside resort, is the most popular beach in Cuba. It boasts 20 km of white sand on the Hicacos Peninsula, about 140 km from Havana. Among the chief attractions of Varadero is the ecologic beach, a natural reserve that shelters one of Cuba’s oldest trees: El Patriarca, a tree-like cactus dated to before 1510, the year the Spanish began their conquest of Cuba.